Observant readers may have noticed that, while I’ve talked quite a bit about preserving, and there have been photographs of shelves of jams, jellies and marmalades, I haven’t actually posted any recipes for them. Yes, I’ve posted about my 2-in-1 method for quince paste and jelly, and in the middle of my citrus overload there was some discussion of lime curd and Indian lime pickle, but no marmalades or jams. The reason for this is pretty simple, it’s an area where I honestly feel like a bit of a fraud. Even though since March this year I’ve made [pause for quick count] a now slightly staggering 23 different preserves; apart from the exceptions above, the method for all of them has come from one book – Rachel Saunder’s Blue Chair Jam Cookbook. The resulting preserves are fabulous, the best I’ve ever made by miles! But, that’s because while I’ve made some slight changes to fruit types and seasoning, I’ve anxiously followed every meticulous instruction – and there are a lot of them! So, for the full detailed immersion in everything jam and marmalade, I have to recommend her book (which has a reasonably priced Kindle version by the way), but I’ve decide to have a go at interpreting one of my favourites. 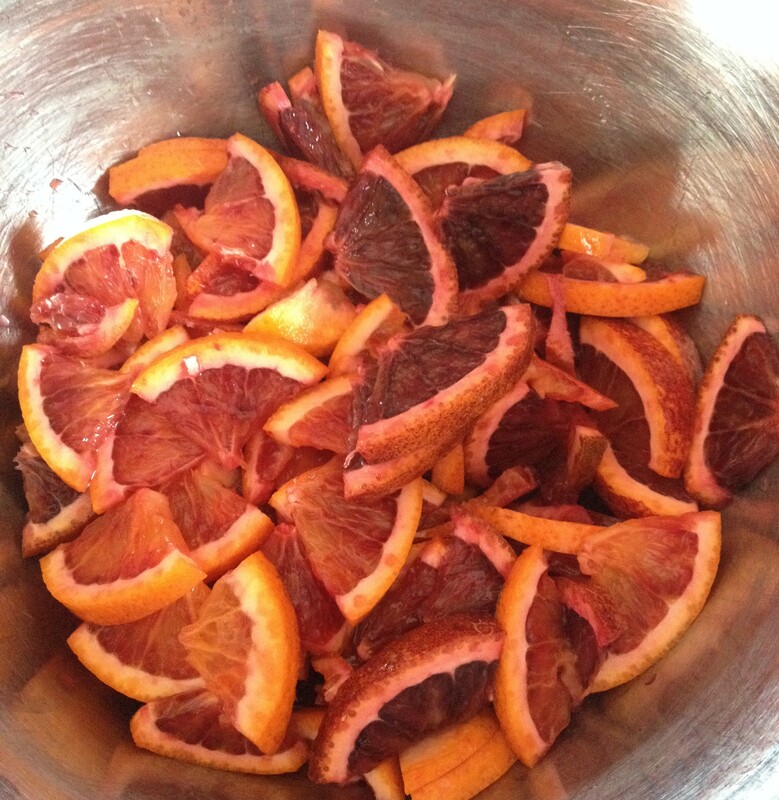 This particular marmalade is one of the few early spring preserves, using the overlap between the last of the blood oranges, and the beginning of strawberry season. It uses a technique found in a lot of Rachel’s recipes, which involves using two different fruits, but only adding one of the sliced fruits to the end product, with the other cooked until all the flavour and juice is extracted and then discarded. This is particularly nice for marmalade, as previously I’ve always had so many chunks it was almost unspreadable, while this has enough jelly to give a really nice texture. 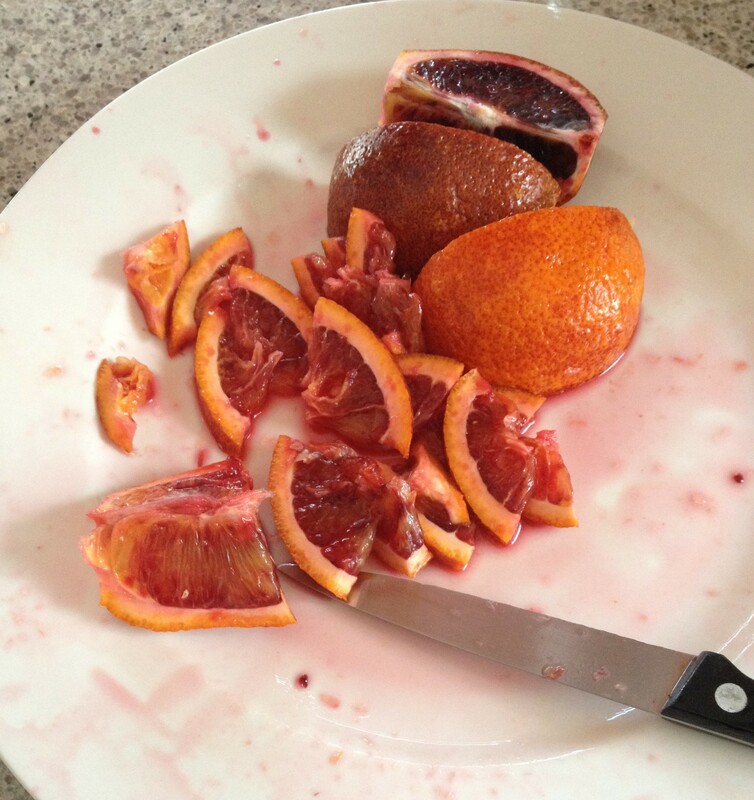 For this blood orange and strawberry marmalade, the strawberries are cooked down until they fall apart, then their strained juice is combined with soaked and cooked blood orange slices and their cooking liquid, and then both are cooked with sugar until you get a beautiful dark red jelly with suspended slices of blood orange. Don’t be concerned by the fact that this occurs over a couple of days; the hands on time isn’t that long, and it’s actually easier to do it in a few stints. I forgot to take any process shots for this one, so look at the quince post for pics of the jelling process. 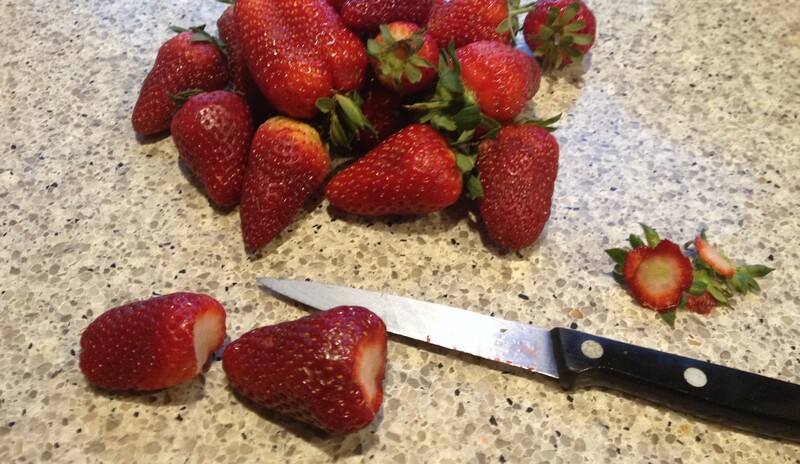 Hull the strawberries, and put in a medium saucepan. Barely cover with water, and simmer for at least an hour until the strawberries are grey and mushy (and very unappealing!) and the liquid is slightly syrupy. Strain through a fine sieve, or a sieve or colander lined with a chux cloth/muslin, into a bowl for at least six hours, or overnight. Cover with a cloth or plastic bag if leaving overnight. While the strawberries are cooking, cut the oranges into quarters lengthwise, and slice thinly across as illustrated above. Cover with water by a couple of cm, and soak overnight, covered. You might need to press the oranges down to check the water level, as they will float. Simmer the orange slices in the same water until very tender, 30 min or more. Remember they will get slightly firmer when you add the sugar, so they need to be soft enough for you to easily crush the peel between your fingers. Now for the fun part! In the largest saucepan you have, combine the oranges and their liquid, the strawberry liquid (discarding the strawberries or perhaps chucking them in a cake), the sugar, and the smaller amount of lemon juice. Stir well and add more lemon to taste, so it just barely adds a touch of tartness. Sterilise the jars, I use this method, and put a saucer and teaspoon in the freezer to test the set. Bring the mixture to a boil over high heat and continue boiling rapidly for about 30 min. Any jam or marmalade with strawberries will foam a lot, so don’t walk away, and be prepared to turn the heat down or take it off the heat if it foams up too much. Stir occasionally with a wooden spoon or silicon spatula to ensure the bottom isn’t sticking. After 30 min, or when you think it might be nearly ready, pour a small amount in the chilled spoon and put back in the freezer on the saucer for a couple of min. You may need to test a few times. When the cooled liquid turns jellyish, it’s done. Another sign is the marmalade forming a slight skin and wrinkling around the edges of the pan or on the spoon handle. Turn off the heat and skim any foam off the top. Add the rosemary sprigs and stir them through. Leave a few minutes and then taste. When you’re happy with the rosemary flavour, remove the sprigs. Pour the marmalade into sterilised jars, seal and cool. Yum! The finished product looks delicious! I just love the colour of red fruits in preserves and combining the sweetness of strawberries with the tartness of citrus is such a good idea. And pairing red with red is even better. The rosemary touch is intriguing. I’ve seen thyme used in jams too, but never tasted it it. What did you think of the the rosemary, finally? I really like the rosemary – strawberries can be really cloying in jam or marmalade, so the herbal/spicy note of the rosemary works beautifully! I am so impressed with your efforts! Like you I just love making jams and other preserves! I’ve not heard of Jennifer Saunders before. I will be checking her book out asap! Thanks so much for sharing! The jam jars looks so appealing. I would really love to make some jam. And this looks simple enough. I shall buy ingredients next week. Thanks for sharing! thanks Liz, let me know how it goes!